Hey guys! Fall is here! Yay! As the weather and the leaves are changing here in Utah and it looks so beautiful! I have already pulled out the pumpkin spice candles! It’s hard to believe that it’s already fall again. For some of you, this year probably flew by. And for our family, we have SO much to reflect on! Fall has always been one of my favorite times of the year…until last year. Last fall I found myself in the middle of a very difficult pregnancy. I was so sick that I was bedridden for 6 months hooked up to an IV for daily treatments, unable to eat my favorite fall foods (soups), unable to enjoy pumpkin spice anything, or even go out and play in the leaves with our boys. I made it out of the house just briefly last fall to take a couple photos at the pumpkin patch nearby–one of our favorite places to visit! Within 15 minutes, I was back home sick again. My husband took the boys out trick-or-treating and I stayed home to pass out candy to the cute kids in our neighborhood. While we are SO thankful to have a new healthy baby added to our family this year, I can’t help but feel like I need a fall re-do. And that is exactly what I’m going to do this year! My Moment of Yes! is going to be making this fall the best fall ever for me and my family to not only make up for last year, but to celebrate our first fall as a family of 5! I decided it would be best to make a list so I’ve put together a Fall Family Bucket List! We are also lucky to have lots of family members visiting us this fall from out of state to share our special memories together! 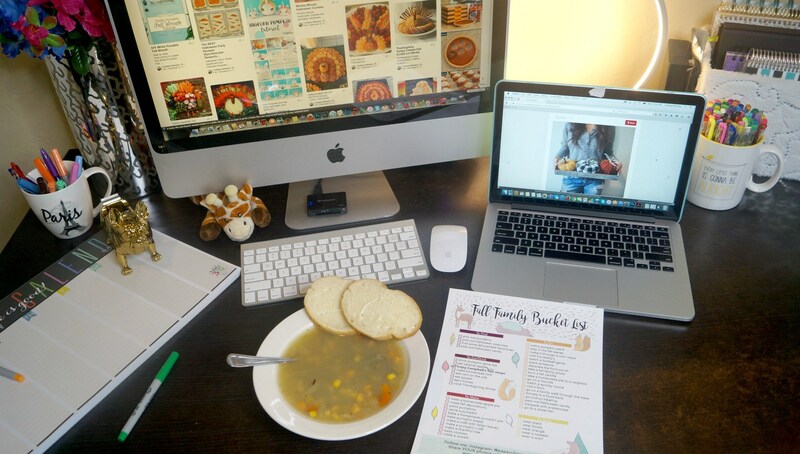 To begin planning our Fall Family Bucket List, I sat down at my desk and looked through my fall Pinterest board while enjoying a yummy bowl of Well Yes!® Roasted Chicken and Wild Rice Soup, and some fall magazines and narrowed down all of my favorite fall things. This year, I’m going to bring fall back like we’ve never done it before! I’ve came up with a fun list of almost 50 fun things to do with as a family during fall and I am SO excited because I get to be part of everything! While I’d love to say I’m going to do them all, I know that sometimes life has other plans. But I do know that this is going to be the BEST fall ever! This year I get a choice! This year I don’t have to miss out on making special family memories. This year I get to say YES! to fall and all the fun that comes along during this special time of year. Who knows– maybe we will check off every item! Or-maybe YOU will with a copy of my Fall Family Bucket List below! There’s plenty of fall to go around for everyone! What are YOUR must-do fall activities? Feel free to browse around for your favorite fall ideas that are a great fit for your family, or make it easy and snag my Fall Family Bucket List below for free! Once the weather cools down, it’s time to get warmed up with a yummy bowl of soup! Have you tried Well Yes!® Soups yet? They are available in 14 delicious flavors (see below for full list) perfect for fall! We couldn’t decide so we got several to try! I am definitely making up for last year! I tend to have lunch at my desk while I work (and the baby sleeps) so a yummy bowl of soup is just perfect! I can’t say enough how THANKFUL I am to have a healthy baby girl this year after all that I went through, and for the ability to eat again! Unless you’ve gone through something like I did, you have no idea just how difficult it really is. It’s also time to start bringing out your plaid shirts and sweaters. I think fall clothing is my favorite of all! Set some time aside this weekend to get your closet fall ready! As much as I love the sun, I also really love being able to layer my outfits and you just can’t do that in hot weather. So bring on the 60-70 degree days! I’m ready for it! Are you? Grab a FREE Fall Family Bucket List Printable HERE and feel free to join in the fun with your own family! This fun list includes several categories: To Find, To Eat/Drink, To Make, To Wear, and To Do. This list is fun for all ages, but I created it with smaller children in mind. Our boys are now 3 and 5 and, of course, we have a 6 month old baby girl! You can follow our Family Fall Bucket List journey on my Instagram, and, if you choose to share your memories as well, please use the hashtag #YEStoFallFun and tag me in your photos! I can’t wait to see how your family will say YES to fall! Well Yes! Soups are the perfect companion to a fall day whether you eat at your desk like me, or enjoy the company of a friend at the table. It’s quick, easy, and yummy and each can serves two people! All Well Yes! soups contain purposeful, non-GMO ingredients that do not contain artificial flavors or colors. You can find these at most grocery stores so be sure to stock up next time you go shopping! Follow Campbell’s Well Yes! on Instagram and Facebook for more yummy soup updates! Don’t forget to enter the #WellYesMoment Sweepstakes in the widget below for a chance to win up to a $500 Visa gift card! It’s as easy as clicking, logging in, and sharing your Moment of Yes story! If you win, think of all the ways you can use the prize to achieve your Moment of Yes!